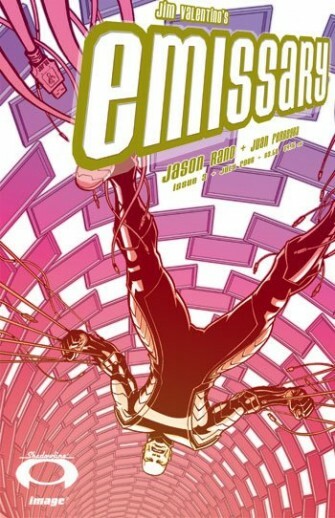 A comic book about a single, world-changing incident wrapped up in the sudden appearance of a superhero seems like a reasonably good idea for a comic, but the execution in Emissary so far has lacked a unifying idea that might live up to its concept. Nothing about the story says grand, stylish soap opera; and nothing about the issues so far indicates an attention to the effect the one outsized element could realistically have on the world at large. Things happen too quickly here; the appearance of the superhero remains ill-defined in terms of its public aspects and could not be processed in definitive ways by people as seems to be happening here -- for example, I'm not all the way certain when sign-bearing citizenry had the time to go home and make signs, or if that's what anyone would do. Ditto some preparations made for the title character. I don't feel like I'm watching a plot unfold but that I'm being moved from place to place on a checklist of plot points. Oddly, Emissary #3 feels threadbare. The supporting characters seem to operate on stageplay evocations of real-world settings rather than actual real-world settings; they don't seem emblematic of people as much as representatives from a world that only goes a few characters deep. It doesn't help that a lot of backgrounds are dropped. The whole comic feels underbudgeted and talky, which is weird for a comic book of this type. It was hard to get through all the talking and I was not rewarded with much in the way of action or plot progression by story's end. Instead I got a plot hook I now have no confidence will be executed in compelling fashion. On final appraisal this feels like a comic book pitch paper made real, the equivalent of an animatic or staged reading, rather than a piece of thrilling pulp art.